I let that negativity roll off me like water off a duck's back. If it's not positive, I didn't hear it. If you can overcome the negativity, everything becomes easier. The first step to success in math is a positive attitude. Yet that's the last thing we can expect from many of our students. One would think that once they were out of school, these folks would have found the real-world value of the math they disdained in school. In an evaluation of math literacy of a random sampling of adults in the United States, 71 percent could not calculate miles per gallon on a trip, and 58 percent were unable to calculate a 10 percent tip for a lunch bill. Yet only 15 percent of those polled said they wished that they had learned more about or studied more math in school (Phillips, 2007). You have to be very intelligent to be good at math. It is acceptable to be bad at math because most people are. Math isn't really used much outside of special occupations. In addition, many people have the attitude, "My parents said they were never good at math, so they don't expect me to be any different." Why is there so much negativity about math? Causes include low self-expectations as a result of past experiences with math, parental bias against math, inadequate skills to succeed at math learning, failure to engage math through learning strengths, and fear of making mistakes. As teachers know all too well, math negativity has various consequences. These include stress, low motivation, decreased levels of participation, boredom, low tolerance for challenge, failure to keep pace with class lessons, behavior problems, and avoidance of the advanced math classes necessary for subsequent professional success. Many parents of today's students learned math by doing worksheets and drills, and they expect the same for their children. Parents who were successful in math through repeated memorization skills (rather than strong concept development) may resent alternative math instruction, such as inquiry and manipulatives, for their children. A possible result is that some parents may feel frustrated when they can't help their children with the unfamiliar homework. However, it is likely that their children don't share these parents' verbal, linguistic, and auditory learning strengths. The top three intelligences found among students today are linguistic, visual-spatial, and tactile-kinesthetic. These are the same intelligences that characterized most learners 25 years ago, but the percentage of students in each category has changed. The proportion of linguistic (auditory) learners has dropped, and there is a greater preponderance of visual learners. Visual-spatial learners now account for more than 50 percent of students, 35 percent are tactile-kinesthetic, and only 15 percent are linguistic learners (Gardner, 2000). In a study that looked at middle school students' perceptions of academic engagement (Bishop & Pflaum, 2005), 5th and 6th graders were asked to draw their typical learning experiences and then draw learning experiences they liked. In the drawings of typical experiences, teachers and chalkboards were the focus, and the students usually did not include themselves in the picture. In the drawings of learning they liked, the students featured themselves prominently. This finding is especially pertinent to math negativity. Consider the frustration that results when children learn math by memorizing facts and procedures instead of building on a firm understanding of concepts. Long division, for example, is an early math challenge, usually taught as a procedure to be memorized and incorporating subtraction, addition, and multiplication—often before these preliminary skills have been fully mastered. Therefore, children typically struggle to solve long-division problems with remainders (e.g., 67 ÷ 8 = 8 with a remainder of 3). Solving these problems is usually not very pleasant for students, but by the time they have completed enough drills and built the mathematical foundation necessary to succeed (usually around 5th or 6th grade), they are inexplicably asked to report quotients with decimals or fractions, not remainders. Textbooks and teachers alternately ask students to round the answer to the nearest tenth, round to the nearest hundredth, express the answer in fraction form with mixed numbers, or express it in fraction form with improper fractions. Students are usually not told why they must make these changes. If they are given reasons, the reasons are often confusing or vague. I recall that the first time I assigned textbook homework that asked for answers to be given in different formats, I did not have a clear rationale for my 5th grade students. No explanation is given for which representation of the answer is best, nor is one provided for when the different variations should be reported; yet the demands to answer questions in these varying formats continually appears on homework and tests. In many schools, children don't have the opportunity to participate in classroom discussions about the real-world implications—that can actually be significant—of remainders or decimals. For example, when it comes to the rate of interest on large sums of money, the difference between 8.3 and 8.375 percent can matter to the borrower. Other times, decimal or remainder answers might be inconsequential, such as figuring how many eight-person tables are needed to seat 67 children at a pizza party. Whether the remainder is 3 or the decimal part of the quotient is .375 does not make any real difference because any remainder or decimal means that an entire additional table is needed. In this light, why wouldn't students develop math negativity, frustration, and stress? They are routinely asked to memorize procedures and are then told—without explanation or conceptual connections—that what was correct last year is no longer acceptable. The curriculum rarely primes their interest with opportunities to want to know how to represent remainders in different forms. Without clearly evident personal value, the brain—operating at the level of information intake and memory formation—doesn't care. Students truly "get" math when they see it applied in real-life ways they care about—in other words, when they see math as a tool they need and want. This motivation is not promoted in word problems about the number of books or the number of students in a classroom. However, when you give small groups of students 67 toothpicks and some index cards and then ask them to model the pizza party seating problem described earlier, they'll build the experiential knowledge of a real-world situation where remainders are not helpful. When they consider dividing leftover pieces of pizza into parts, they will see that fractions or decimals are a valuable tool to make the pizza sharing process fair, whereas a "remainder" would imply that perfectly good pieces of pizza sit in the box because there is no way to divide them. Most elementary arithmetic skills are "learned" by rote memorization and assessed on tests of memory recall. Children who do not excel at memorizing isolated facts are less successful, feel inadequate, and lose confidence in their ability to do math. The result is a cascade of increased math anxiety, lowered self-confidence, alienation, and failure. This is a pity because the ability to memorize basic arithmetic and multiplication tables does not determine who lives up to their math potential. With this goal in mind, the ability to recognize patterns and construct mental concepts that use foundational math facts is far more valuable. Math that is "taught to the tests" has a negative effect even on the children who succeed with this approach. The problem is not that they won't rise to standardized-test expectations; they will, but their achievement will stop there. If your math curriculum doesn't include problems that students want to solve and discussions that connect those problems to what students need to learn, your intervention is critical to prevent increasing student ambivalence to and alienation from math. Before children can become interested in math, they have to be comfortable with it. They must perceive their environment as physically and psychologically safe before learning can occur. Students build resilience and coping strategies when they learn how to use their academic strengths to build math skills and strategies. Your intervention helps them strengthen the networks that carry information through their brains' emotional filters to the area where higher-order thinking skills are concentrated, the prefrontal cortex (PFC). With practice, they will be able to use the highest-level analytical networks in the PFC to evaluate incoming information and discover creative solutions to math problems (in addition to problems in all subject areas). To better understand how your students learn, it is important to first learn how to propel information through those filters and begin building math positivity. No one wants to add to student pressure, especially when you suspect that a student will suffer emotional or even physical abuse if he or she does not meet certain parental expectations in math. Parents with extremely high expectations for their children are usually motivated by a desire to see their children have more than they have themselves. Unfortunately, when children internalize these expectations and don't fulfill them, they can suffer depression, anxiety, physical illnesses (high levels of cortisol associated with chronic stress lowers the immune response), or psychosomatic illnesses, or they may even inflict physical injury on themselves and others. Reversing negative attitudes toward math may take months if your students have been repeatedly stressed to the point of feeling helpless and hopeless. If your students are anxious during math class, information entering their brains is less likely to reach the conscious thinking and long-term memory parts of the prefrontal cortex, and learning will not take place. Stress is the primary filter blocker that needs to be overcome. Perception of a real or imagined threat creates stress, as does the frustration of confusion or the boredom of repetition. Stress blocks the flow of information through the amygdala in the brain's limbic system (i.e., the part that controls emotion) to the PFC, and it diverts sensory input into the automatic, reflexive parts of the lower brain. These are the unconscious, more primitive brain networks that prepare the body to react to potential danger, where the only possible responses are fight, flight, or freeze. Under stressful conditions, emotion is dominant over cognition, and the rational-thinking PFC has limited influence on behavior, focus, memory, and problem solving (Kienast et al., 2008). Prior negative experiences also impede the flow (through the amygdala) of stored memories needed to understand new, related information and to use foundational knowledge to solve new problems (LeDoux, 1994). The implications of stress-related thinking and memory problems are beginning to be understood at the neural level, where emotions enhance or impair cognition and learning (Goleman, 1995). When students are stressed, they can't use their thinking brains. Therefore, a reduction in math-related stress is key to success. Family conferences can help parents learn some of the scientific evidence linking the effects of stress to academic success. These interventions will also allow you to explain that the first step to math success is a positive attitude toward the subject matter, not just to the grades associated with it. You can also suggest ways for these parents to be involved in a positive way. Explain that the brain is most receptive to learning about a topic when there is a clear link between that topic and something the child values. Parents can act as "math allies" if they find ways to integrate real-world math into their child's hobbies and interests. For example, they can encourage their children to calculate how long it will be until their special television show begins if it is currently 3:00 and the show starts at 5:30. They can also help their children compare the costs of things they like (e.g., bicycles, toys, computers) in newspaper ads that offer various percentage discounts off different base prices. Reassure all students that if they want to achieve high grades, they will have opportunities that will allow them to regain some sense of control, such as retests. Because progress in math is so strongly based on foundational knowledge, students need to achieve mastery in each topic—which forms the basis from which students can extend their neural networks of patterns and concepts—before they move to the next level. Retests provide opportunities to reevaluate answers and make corrections, as necessary. To ensure mastery, I require that students take a retest when they score under 85 percent. My primary goal is to have students learn the appropriate material so they can move forward with an adequate background for success. Incorporating accountability into retesting allows students to build skills related to self-reliance, goal planning, and independent learning. Parents or colleagues may voice concerns that students might not act responsibly or seriously once they realize that they'll have a second chance. Accountability increases when you require students to provide evidence of corrective action, such as participating in tutoring, doing skill reviews, or finding textual examples that correctly demonstrate how the type of problem is solved. If the original test and retest scores are averaged together, students understand that they remain accountable for that first test grade. Compared with cheating (an unfortunate response to grade pressure that further decreases confidence and self-esteem), the option of taking retests is a more positive approach to low grades. Retesting takes time on your part, but it shows your students that you respect their capacity to be responsible, successful learners. Key to developing students' interest in math is to capture their imaginations. Instead of allowing them to think of math as an isolated subject, show the extended values of math in ways they find inspiring. If you teach elementary school, find opportunities throughout the day to show students the ways they benefit from mathematics and how it is applicable to their areas of interest. For example, students can use math to determine the number of absent students by counting the students present and then "counting back" to subtract. In upper grades, cross-curricular planning is a way to achieve this goal. Older students, for example, can solve meaningful problems related to the quantity and price of tickets they need to sell in order to cover their expenses for an upcoming field trip. When you increase your students' positive feelings toward mathematics, you unlock their brains' math-blocking filters, promote long-term memory, and foster greater understanding beyond rote memorization. Solving problems with insight is a function of the anterior cingulated cortex (ACC) within the prefrontal cortex. The ACC also allocates attention resources and modulates motivation. Functional magnetic resonance imaging (fMRI) scans show increased metabolic activity in this region when subjects think about how to solve a problem. A recent study (Subramaniam, Kounios, Bowden, Parrish, & Jung-Beeman, 2009) showed that even before the subjects realized the answer, the ACC showed increased activation, predicting their subsequent awareness of the insight. Positive emotional states increased greater baseline activity in the ACC and were associated with more successful problem solving. A related study (Fredrickson, Tugade, Waugh, & Larkin, 2003) demonstrated expanded peripheral vision during positive emotional states and more creative problem solving. Negative emotions, on the other hand, narrowed peripheral vision and appeared to similarly limit insight. To demonstrate interest in your students as individuals, and to acknowledge that they may have had previous negative math experiences, ask questions they can respond to in a math autobiography, a class discussion, or a private conversation. I use math autobiographies to give students an opportunity to tell me what previous teachers did that they found either helpful or unhelpful. Their answers sometimes point out things I do that students find disturbing, such as, "My teacher let the class get pretty noisy and then she'd just speak louder than the noise." Other responses are windows into the causes of specific problems, such as low participation. Another student wrote, "When I'd ask my teacher for help with a problem, she'd say, 'What's not to get?' so I stopped asking questions." Can you remember a time when you were excited about something at school? You may have been nervous, but when you started kindergarten did you feel you were now a "big kid" too? Did you look forward to experiencing some of the good things you had heard about, like making handprints, playing on cool playground equipment, getting new school supplies, learning new things, and seeing your friends every day? Can you recall a time when you were proud to answer a question or when you got a good grade after studying hard? Did you ever help a friend understand something in class or invite a classmate to join your group when he or she didn't have a partner? When did you first wake up and not want to go to school or hope it was a weekend? What did teachers do that turned you off to school? To math? Did you ever lose interest because you weren't learning new things or because you didn't understand things that you thought everyone else did understand? You may need to stimulate these discussions about negativity with your own experiences; this sharing will also increase the bonds between you and your students. Think about times when you felt overly challenged, out of place, or ready to give up. How did that feel? In all likelihood, these feelings were similar to many of the emotions your students deal with. Share those experiences with your students, along with coping mechanisms or solutions that helped you deal with and overcome your negativity. Report cards and grades are often high-stress experiences that remain as strong negative memories. Clearly explain your policies concerning credit for partial work (if a serious attempt was made to solve the problem) and for homework corrections. Point out that simply copying the question will help students build their math brains, and after they review their homework, they will have more success when they return to problems they copied down instead of facing a blank page. I offer students the opportunity to decide on categories in which they will assess me and then give me report card grades. My recent 7th grade class selected the following areas: kindness, organization, fairness, friendliness, favoritism, knows material, funny, listens, and explains material well. In their first grading period, the grades were highest in these categories: kindness, friendliness, fairness, favoritism (indicating a lack thereof), and knows material. However, many of my students felt that I needed to improve my listening and explaining skills. I was disappointed, because I thought I'd been doing well in those areas. I asked for some specific examples (they could offer them anonymously in writing or orally) and received valid feedback. I had a colleague observe my classes a few times and focus on those two areas. She helped me identify times when I could have done a better job of listening and explaining, and I implemented changes. The experience was valuable, and I continue to show students that I value their opinions each time I have them write my report cards. My hope is that I model appropriate responses to their feedback as I continue to be a learner. 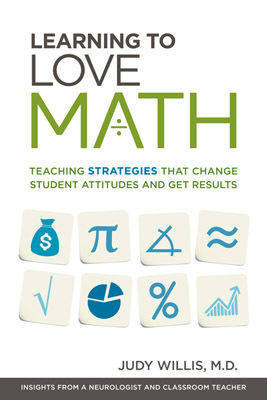 When you help your students build a positive attitude toward math, they become engaged in the material and motivated to excel in mathematics because they value it. When you offer experiences and opportunities that inspire your students to measure, question, and analyze things around them, they will want to acquire the knowledge and mathematical tools necessary to achieve those goals. Once you reopen doors that were previously closed by negative feelings, math is revealed to students as an accessible, valuable tool to help them understand, describe, and have more control over the world in which they live.